I want to describe my personal experience of him. I stayed at Belur Math in January 2007 for two weeks. While there I took darshan from him in the presence of two lay initiates, Antonio Carlos y Schrega and Jim Harris. According to them, he gave me a very unusual kind of blessing that I did not see. A few days later, from the International Guest House, I saw six gentlemen in Western dress emerge from his house. I was told that they were doctors who had been called in to consult on his “condition.” I of course did not know what condition was being referred to. 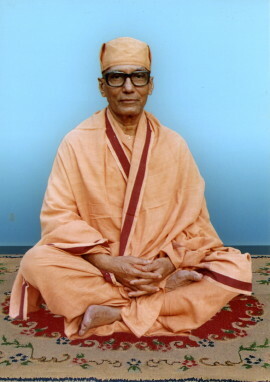 When I saw him, he did not exhibit the tremor typical of Parkinson’s Disease, nor any other symptoms of the “rapid deterioration in his health” to which Atmasthananda refers in his memoriam. It is true that he could neither speak nor ambulate on his own. But he was fully alert, and very, very conscious. When I saw him, he was close to nirvikalpa samadhi. That was the reason for the beatific tranquility of his expression, so often remarked by those around him. The reason he could not speak was because there were no words for what he was experiencing. The reason he was unable to move on his own was because he no longer had any ego-self and therefore no capacity for individual agency. And what he was seeing when he looked at one was far, far beyond the conventional associations and functions by which we distinguish objects, events and persons in the world of name and form. By looking directly, openly and fearlessly back at him in those moments, one allowed him to give one the darshan of direct consciousness and experience of Atman: the unmediated knowledge of self. If one was willing to receive it, he was willing and more than able to give it.